The National Centre for Genetic Resources and Biotechnology (NACGRAB) has poured encomium and commendation on the University (FUNAAB) for being at the forefront of meaningful research ditto historical scientific breakthrough with Improved Indigenous Chicken Breed otherwise known as FUNAAB ALPHA. The CEO of NACGRAB and Registrar of Crop Varieties, Livestock Breed and Fisheries, Dr. Sunday Aladele gave the commendation moments before presenting Certificate of Registration of FUNAAB ALPHA to the Vice-Chancellor, Professor Kolawole Salako at the University’s Senate Chamber. Dr. Aladele who could not hide his admiration for FUNAAB’s appreciable impact, especially in the area of research, described her latest exploit with FUNAAB ALPHA as “a real breakthrough” and the University “a real Centre of Excellence”. According to him, “FUNAAB ALPHA is a real breakthrough because the last time we registered was in 2000 and since then our committee has been worried. But for the first time we are having improved chicken breed with local background and this is coming from the stable of FUNAAB”. Extolling further the University’s giant stride in research, Dr. Alalade stated that “FUNAAB is really a Centre of Excellence, FUNAAB is one of the few Universities that came up with two (2) registered indigenous Rice FUNAABOR 1 and FUNAABOR 2”. In the same vein, the CEO of NACGRAB said some researchers in the University have been playing pivotal role towards the progress and development of the Centre as members of Technical Sub-Committee. According to him, they are Professor Olufunmilayo Adebambo, Professor Samuel Otubusin, Professor Ariyo and Professor Christian Ikeobi. Dr. Aladele commended and thanked the University’s management “for all the support given to the Principal Breeder to be able to register FUNAAB ALPHA”. 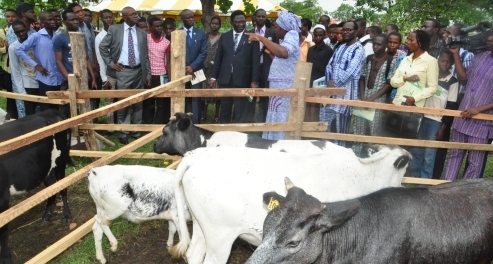 He enjoined the University to monitor the performance of the chicken breed for sustainability and posterity.